Watermelon is one of the best summer foods. There are many varieties now that range from miniature to seedless. Watermelon eating and spitting of seeds has been a great past time for families for many years now. The sweet treat has brought lots of happy moments and satisfied bellies. People love watermelon no matter what. However, there is something extra nice about a watermelon that you grew yourself from your own gardens, with you own hands. That’s a beautiful occasion to celebrate. They are not difficult to grow and anyone can do it. Start with a few seeds. The variety of seeds available for purchase is almost too many to even keep up with. Go to your local gardening center of nursery and ask them for a recommendation. 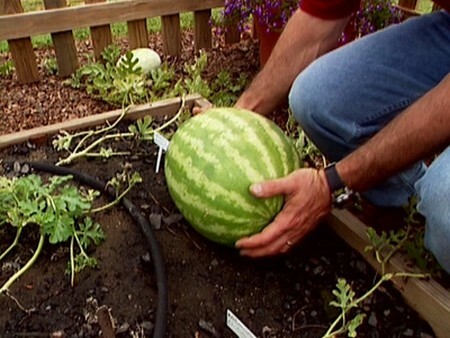 Here is how you can grow your own watermelon. Read on for more information. You can start your watermelons inside in a pot. Use peat moss to help with the process. You will need to keep the watermelon warm and give it plenty of light. It has to stay well moisturized as well. When the ground is suitable you can transfer the seedlings. They will be the optimal size to move by that time. You can also have some patience and plant when the weather is how enough. Use a garden rake to move the soil you loosed to form five mounds. Put a “hill” in every corner and one in the center. All the hills should measure approximately 1 foot high and 2 to 3 feet wide. Make a 6 inch deep hollow that is 1 ft. wide at the very top of every hill. Put some compost into the hollows and mix it fully with the surrounding soil. Put two watermelon seedlings in 3 holes in the hollow basin. Put them just underneath the top soil level to match the depth of the pots. For seeds, plant 3 holes and put in 3 seeds in every bowl. This should be about 1 inch deep. Use the garden rake to pack the soil in. Water each place until it can’t hold any more water. Let it drain, then, water when necessary. Don’t allow the soil to dry out too much.